Buy this item and earn 104 ClubPoints. 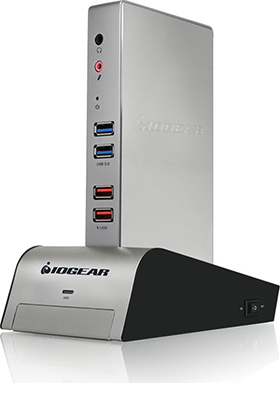 IOGEAR's Met(AL)™ Vault Dock, USB 3.0 universal docking station with HDD enclosure quickly and easily turns your laptop, Ultrabook™ or Microsoft Surface® Pro tablet into a full-featured workstation with support for dual monitors (DVI-I and HDMI). Featuring a gigabit Ethernet port, two USB 2.0 ports, four USB 3.0 ports, two dedicated USB fast-charging ports, microphone / speaker connections with a HDD enclosure, Met(AL)™ Vault Dock has connections to suit virtually any application. Met(AL)™ Vault Dock gives you the power to connect two extra monitors. Dual monitor outputs allow you to edit videos on one screen, compose the soundtrack on another screen and check email on your laptop screen all at the same time! Tablets and 2-in-1 laptops are portable and easy to use. However, these touchscreen devices lack the range of capabilities that makes desktop computers the standard for workstations. Ultra-portable touch-screen devices oftentimes fall short when it comes to ports, storage capacity, and a fast, comfortable keyboard. With the power of Windows®, tablets are now ready to replace your home PC. When it's time to go from leisure time to work, just plug your Windows® enabled tablet into Met(AL)™ Vault Dock and it becomes your full-blown work center! Now you can create a workstation suitable for nearly any task. Where did my peripheral connectors go? Did you just buy the latest ultrabook or MacBook only to find there are few or no USB ports and Ethernet (RJ-45) connector? No problem. 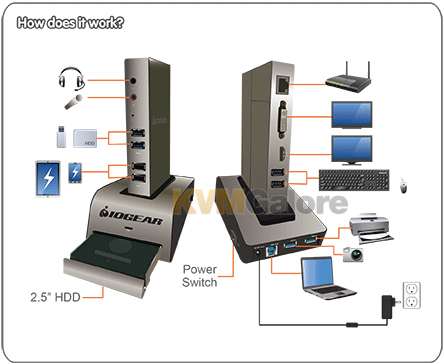 IOGEAR's met(AL)™ Vault Dock has everything needed to connect you to your world. Met(AL)™ Vault Dock stands out from the rest from the minute you look at it. The docking station sits vertically into the HDD enclosure docking base and this not only creates a unique look, but gives you easy access to all the ports on the docking station. The clean lines, unique shape and all-aluminum housing of Met(AL)™ Vault Dock give any workstation a premium and sophisticated look. The aluminum casing is not only sleek, but also provides superior protection and durability to withstand even the worst of every day wear-and-tear. Complaint with USB 3.0 standards, Met(AL)™ Vault Dock can process all your tasks at blazing fast speeds. The power of USB 3.0 allows you to transfer data at up to 5Gbps – that's 10 times faster than USB 2.0! 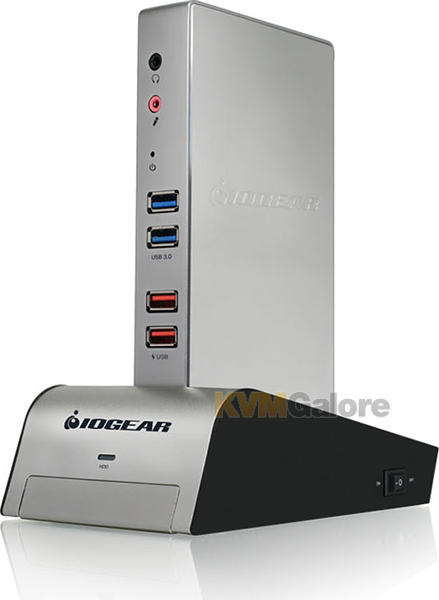 IOGEAR's Met(AL)™ Vault Dock gives you unprecedented storage capacity by allowing you to add a hard drive to the docking station. 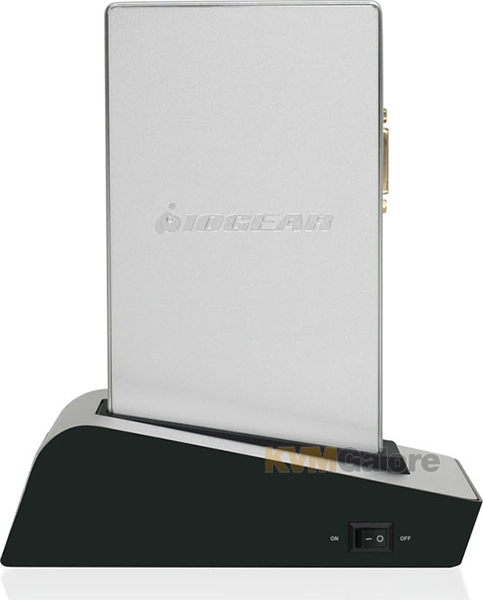 The docking base opens up to reveal a HDD slot that is compatible with any standard 2.5" SATA hard drive. Now you can store all your videos, pictures, music and documents in one place and take it with you wherever you go. This versatility makes Met(AL)™ Vault Dock the perfect docking station for work and at home. When it's time to leave the office, simply unplug the dock and take it home with you.